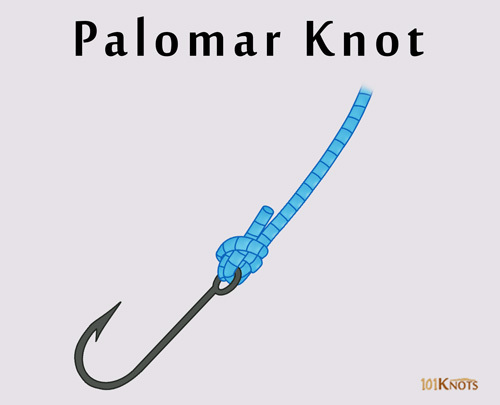 The easy to tie, strong Palomar (pronunciation PAHL-oh-mahr) knot attaches a fishing line to a hook, snap or swivel and a fly to a tippet or leader. Though it is good for monofilament and fluorocarbon fishing lines, it performs best with braids. With just a little practice, you can tie it even in the dark and with cold hands. Its breaking strength was found to be 14lb to 15 lb based on certain tests done with braided lines. It is popular among saltwater anglers who have given it good reviews and ratings. The printable diagram below shows you the tying procedure step by step. You have to start with about six inches of a doubled main line. Trim off excess tag ends, if any, in the final step. Ensure that all parts of the knot are secured together properly when the lure or hook is passed through the loop as shown in step 4. Note that an overhand knot is formed in step 3. The knot is formed around the bight right below the eye. This leaves the hook free for rotation around the knot. In some erroneous illustrations, the final loop is shown positioned against the shaft of the hook that restricts its movement. Do not cross your lines midway while tying the knot. It severely compromises the knot strength and might cause it to break. It can be used to connect lead core lines to swivels by breaking off the lead at the tip by a few inches. It is not recommended for heavy mono leaders. It suits light lines more. Double Palomar knot – Employs two wraps instead of one as pictured in step 3 above. Improved Palomar knot – It is a modified version that boasts of greater However, it’s not as strong as the improved uni knot for braids. Not suited for making hair rigs. The knotless knot is better in this regard. Trilene knot – It is more prone to slippage, though an equally strong alternative. 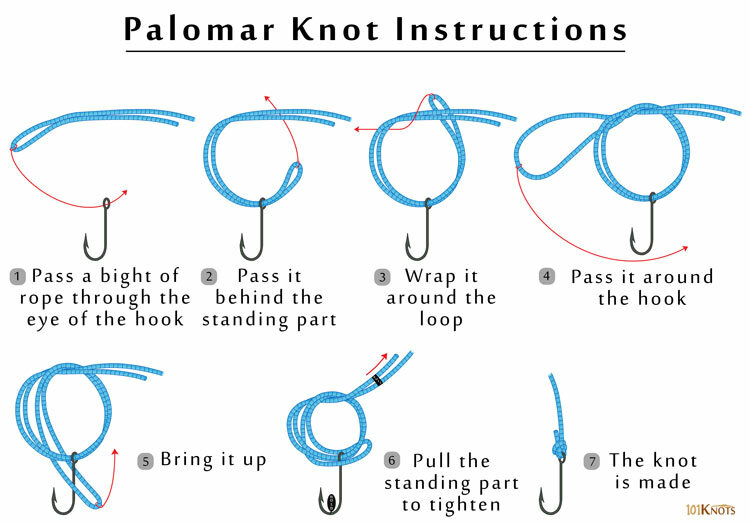 Improved clinch knot – Not suitable for braided lines, unlike the Palomar. Snell knot – Weaker knot suitable for circle hooks. Uni or Grinner knot – Weaker alternative. Clinch knot – Doesn’t suit braided lines. Same goes for the Rapala knot. Fisherman’s knot– It is a bend and not a hitch. Fly, carp, catfish, tuna, musky, surf and bass fishing. Other fastening applications like attaching a dog clip to a rope.